How precisely can we predict the results of measurements on a physical system? In the world of tiny particles, which is governed by the laws of quantum physics, there is a fundamental limit to the precision of such predictions. This limit is expressed by the Heisenberg uncertainty principle, which states that it is impossible to simultaneously predict the measurements of a particle's position and momentum, or of two components of a spin, with arbitrary precision. In this case, the results of measurements on system A can be used to predict the results of corresponding measurements on system B with arbitrary precision. This is possible even if systems A and B are spatially separated. The paradox is that an observer can use measurements on system A to make more precise statements about system B than an observer who has direct access to system B (but not to A). The experiment used lasers to cool atoms to just a few billionths of a degree above absolute zero. At these temperatures, the atoms behave entirely according to the laws of quantum mechanics and form what is known as a Bose-Einstein condensate—a state of matter that Einstein predicted in another pioneering paper in 1925. In this ultracold cloud, the atoms constantly collide with one another, causing their spins to become entangled. "The results of the measurements in the two regions were so strongly correlated that they allowed us to demonstrate the EPR paradox," says Ph.D. student Matteo Fadel, lead author of the study. 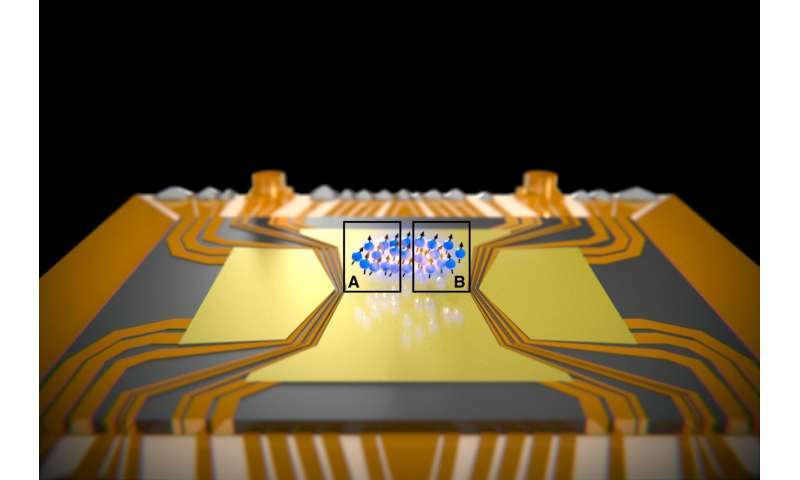 "It's fascinating to observe such a fundamental phenomenon of quantum physics in ever larger systems. At the same time, our experiments establish a link between two of Einstein's most important works." Big quantum computers are more and more real and possible. Also there is never collapse of the wave function, even with many billion particles, so that, as pointed by Everett, our universe splits in many parallel entangled quantum parallel universes in every measurement, like the many micro nano parallel universes in quantum computers, before measuring in one possible universe..
mackita> The violations of uncertainty principle are important from practical perspective, as they may lead into https://www.reddi...rce_of). Similarly to general relativity we can expect subtle violations of it (dark matter, fly-by anomalies) once we move from scope of quantum mechanics both toward smaller or larger scales. The violation of uncertainty principle within small magnetic domains of ferromagnets is of particular importance there: their number of atoms is still small enough for to utilize quantum mechanics principles but already high enough for to behave classically. Confining particles between thin sheets of nano spaced graphene in magnetic fields, the Brownian motion of the particles will generate electrical currents continuously where the graphene will act as conductors building Brownian motion battery cells, miracles happen in the quantum nano world. There is no end to this mackita! Get nano spaced sheets of graphene with close packed perforations of molecular holes just large enough to pass air molecules through and pass dense magnetic fields over the holes and the diamagnetism will separate the oxygen from the nitrogen which you can make flow between the sheets where you burn the oxygen and fuel then let it mix with the nitrogen as simply hot air and the exhaust will be carbon dioxide, and I'm quite sure the graphene sheets will oblige by a combination of arrangements will split the carbon dioxide into its constituents parts to repeat the cycle. Errr, spin and position are not complementary under uncertainty. Spins on two axes are, and position and momentum are, but spin and position are not. Looking the abstract of the paper over it appears that what was actually measured was spin on two axes. "Heisenberg uncertainty principle states that it is impossible to simultaneously predict the measurements of a particle's position and momentum, or two components of a spin, with arbitrary precision"
What is the difference between "spin and position" versus "momentum and position" because momentum is spin, you cannot have momentum without spin, as spin is the equivalent of velocity you cannot have spin or velocity involving quantum particles without momentum, even photons have momentum. Any quantum particle that has momentum has position and consequently spin so there can be no distinction between spin, position, and momentum. Spin and momentum are not the same operator, nor are they complementary operators. This means you can measure spin on one axis, and momentum, at the same time with arbitrary precision, that is, without Heisenberg uncertainty. Uncertainty only applies to complementary operators. Your statement, "momentum is spin," is incorrect. You need to understand the exact meaning of spin when used by particle physicists, which is spin angular momentum or SAM. There is another type of spin, called orbital angular momentum or OAM, and yet a third called total angular momentum or TAM. SAM + OAM = total angular momentum, which is conserved. Both SAM and OAM are quantized and occur in units of 1/2 (dimensionless); this means that SAM can be exchanged for OAM, without affecting TAM and with all operators that are conserved remaining conserved. It would be best, if you're going to discuss angular momentum, if you understood it. Any discussion of spin, moment or any rotation is unclear, because science does not know the movement of celestial bodies, nor their exact paths. Take into the arrangement of two celestial bodies (maybe two particles, neutrons and positron), which rotate along one of the conic sections, but along that path the center of mass (or center of the energy state of the particles) is moving. Then, due to the constant torque (the sum of the kinetic and potential energy of the body-one relative to the second body), radial motion occurs, whose kinetic energy is transformed at the moment of the coupling of two vectors of the same size, and the opposite directions (spins). One spin is its own, and the other is the rotation of the body around the center of the mass (pericenter), on the sinusoidal radius (the opposite direction from its own spin around its own axis of rotation). When this doctrine learns and understands and when they find it to be learned, I will explain this My Copyright to about 15 pages of text and formula. And these experiments with lasers will never give or allow to see the true image of the behavior of the particles. It's the same procedure as when you put a group of innocent people in prison and you want to find out how they behave when they are free. Quantized momentum is spin without it's pound of flesh, as are electrons without momentum with their measurable gravitational field, you cannot have your spin without your pound of flesh just as you cannot have your gravity. Is this a tenant of the uncertainty of Heisenberg's uncertainty? A contradiction in terms! We all live in a physical world as our world is which our quantum-world is. However weird and uncertain our macro-world is we perceive it exactly as we perceive our quantum-world. The apparent difference is in the interpretation, we interpret the world we are capable of observing up to the limits of our senses in what we perceive as logical and normal so our macro-world appears normal even though it is not. Had we been able to physically observe the quantum-world we would also perceive it as logical and normal even though it is equally not. The consequences of being able to observe both the macro and quantum world simultaneous would be our mathematical description would only be describing one world and just as we perceive it as logical and normal so would our mathematics just as they do now in our macro-world. Our favourite Trolls, misaligned and grossly misunderstood rarely engaged in meaning full dialogue increasing their isolation forcing them to survive on the outskirts of society, living in woods and caves becoming shy and isolated, but under their gruff hairy unkempt exterior are hearts of gold handed down the millennia spoken in trollian that few specialised scholars have retained that rare ability to translate. It would be great if the discussions below the article about EPR wouldn't get cluttered by illogicality of reasoning creating uncertainty, making uncertainty a self fulfilling philosophy by attaching its self to a simple physical fact that to have momentum is to have spin and Trolling it through mud. Heisenberg is not uncertain unless you make it so, so don't Troll it. @"many-particle system of several hundred interacting atoms"
Does it sound to anyone like a gaping locality loophole? A point in space is a vector. Spin or velocity is a vector. Measuring a vector in space is determining the position of one point in space relative to another point in space, which as a point in space is a vector…..
You only determine your vector by measuring relative to another vector. Which comes back to accuracy, accuracy is relative to the accuracy of your relative vector …. A vector is spin, velocity and a point in space. A point in space is a coordinate…… a vector is a coordinate. Spin, velocity and a point in space is a coordinate…….. Heisenberg's accuracy relies on the instruments ability to measure coordinates. "Spin and position" versus "momentum and position" subtracting mass from momentum "momentum and position" becomes "spin and position" where "spin and position" are actually coordinates. Heisenberg's principal was only measuring one factor all the time - "Coordinates" - . Vector is a symbol that determines a certain size: the beginning, direction and direction of a certain size. The point of the point can not be a vector, but the distance between the two points can be a vector. Hysenberg's indeterminacy in matter particles shows that we can not determine the position or moment of motion of a particle, because by measuring it by any means, we are changing the energy state of the particle, and this state is also influenced by many external factors that we do not know how they work. What can you determine the position of the electrons around the nucleus, if the electron rotates around the nucleus a few billion million times a second? Can the photon cut this path without disturbing the state of the electron? This is why milnic I steer well clear of statements such as "measuring changes the energy state of the particle" because it is a contradictory statement. Atoms being cold in close contact all move at the same speed "entangled" implies measuring the coordinates of one atom is the same as measuring any atom. Atoms at room temperature have varying temperatures "untangled" move at different speeds, implies each atoms coordinates have to be measured separately unless an average temperature is assumed. According to your view, when a terrorist, armed with an explosive device, enters a crowd of people who normally behave, it can not disrupt the existing state, even an explosive. "Good Thought" !! Your photon, with which you want to measure something in a bunch of elemental particles, is a terrorist, because you have armed it (laser beam of air or photons) with additional energy to penetrate into that crowd. And the other is more important, you do not know the role of substance Aether, without which there is neither movement nor the existence of anything in the material energy entity of the universe. Why is your every waking moment occupied with being blown to kingdom come! its time you found new digs preferbly far away from dark thoughts. have you ever thought of coming acrosss to Cambridge in east anglia, where all the famous scientists come from Newton, Cavendish, hawking the richest University in the world, no bombs going of over here. 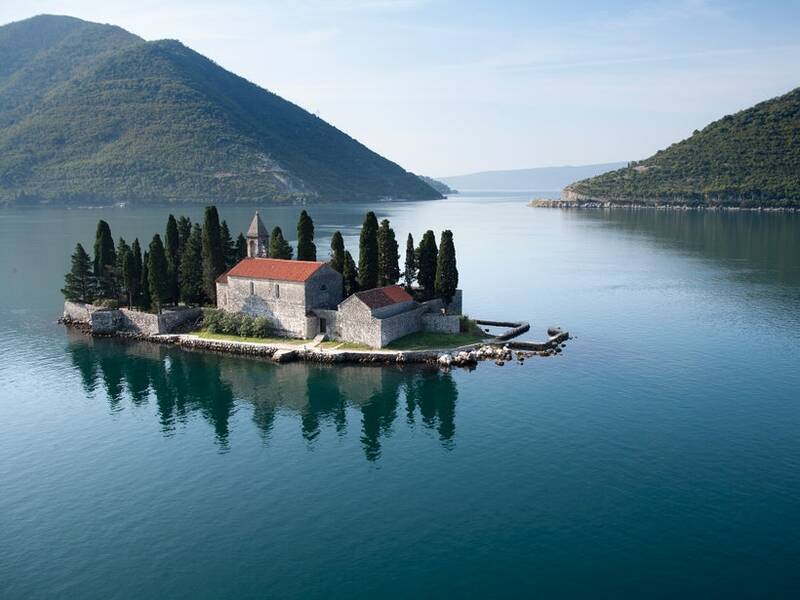 Milnik:- Montenegro is of one of the best scenic places on earth to visit https://media.cnt...7738.jpg Why are you spoiling it with your dark thoughts. Take a break and go out in the country side and visit the sites! https://www.cntra...ntenegro Welcome to 2018 milnik, welcome to Montenegro!. Most of today's scientists are "tainted" by Einstein's and Lorenz's fatamorgans, which also contains the conviction that everything came from nothing (BB). On the basis of these theories that do not recognize and do not know the structure of the universe, science has come to the point where it is not known whether the creation of human beings, their role, all the capabilities that human beings will possess, nor science wants to find out, he formed all this and from what it all originated. Who, then, are those people who neglected and rejected the one who created them, and they want to find out many causes in the universe, which are much older and more complex than we are as the last patent of the Creator in the universe. We need to know what matter is and what it is formed from, and draw conclusions as to why gravity and magnetism arise. These experts from Cambridge and other scientific institutions use their own knowledge and experiences before others, but who has enabled everyone to possess these opportunities. If they do not respect this, it is certain that they have gone completely wrong by understanding and learning the true causes of the phenomenon in the universe. My task is to try to restore science to the right path of understanding the universe and ourselves, with this discourse. This is what I am trying to give you all scientists to believe in the one who formed you and who gave you the opportunity to understand the phenomena and their causes, you call my thoughts black thoughts. Which one of us has the "dark" matter, energy and oxidized consciousness in our head. Awareness is the power to recognize and understand the true causes of the phenomenon. If you do not believe in the existence of the Spiritual Entity of the universe, then you do not have any awareness, nor do you have a link that links you with that entity. That's why you are going the wrong way, but there are natural codes that will also bring back to the beginning of a new and real knowledge of what you are now unable to understand. Who formed Montenegro in the way you paint me? milnic> We need to know what matter is and what it is formed from, and draw conclusions as to why gravity and magnetism arise. These experts from Cambridge and other scientific institutions use their own knowledge and experiences before others, but who has enabled everyone to possess these opportunities. If they do not respect this, it is certain that they have gone completely wrong by understanding and learning the true causes of the phenomenon in the universe. My task is to try to restore science to the right path of understanding the universe and ourselves, with this discourse. How long is going to take for you to descend into gloom and despondency where you're every waking moment is occupied with being blown to kingdom come! Your understanding of the phenomena, which are natural and logical, are always obscure and obscure so much that you are not aware of your statements. But it's not a miracle, the one who formed you is waiting to clear your consciousness, which may take a little more incarnation. milnik> Your understanding of the phenomena, which are natural and logical, are always obscure and obscure so much that you are not aware of your statements. But it's not a miracle, the one who formed you is waiting to clear your consciousness, which may take a little more incarnation. Everyone is counting down the hours when you yet again descend into gloom and despondency where you're every waking moment is occupied with being blown to kingdom come! Which milnic is apt, as you journey on the Path to Righteousness of Science, but your dark thoughts won't gain you entry into those heavenly folds, you have to expunge your sins in the fires of eternity to gain entry. Instead of destructively detecting a reflecting micro-wave photon, entangle it first then measure the secondary entangled photon. By measuring the secondary entangled photon it unravels the entanglement between the two photons. The original photon has effectively been measured! Bypassing "Heisenberg theorem", which states that it is impossible to simultaneously predict the measurements of a particle's position and momentum, or of two components of a spin, with arbitrary precision. Never engrave "Heisenberg theorem" in tablets of stone, because theories are in the mind where ghosts reside, you have to watch or they come back to haunt you when theories fall flat. Is this photon on the rebound at room temperature Makita! Well spotted. mackita concerning your trollian obsession reading through this maze of trolls one comment in particular should not have been encouraged, we can all read; you know the one. Given he has a translation barrier, he's been told by your troll a holidays due because of it. I wish you would not misalign our innocent trolls.